Real gross domestic product (GDP) of the U.S. economy grew at annual rate of 2.0% in the third quarter, after a 1.7% increase in the second quarter. However, final sales advanced only 0.6% in the third quarter, following a mild 0.9% increase in the second quarter. As shown in chart 1, final sales show a decelerating trend after an increase of 1.2% in the fourth quarter of 2009. 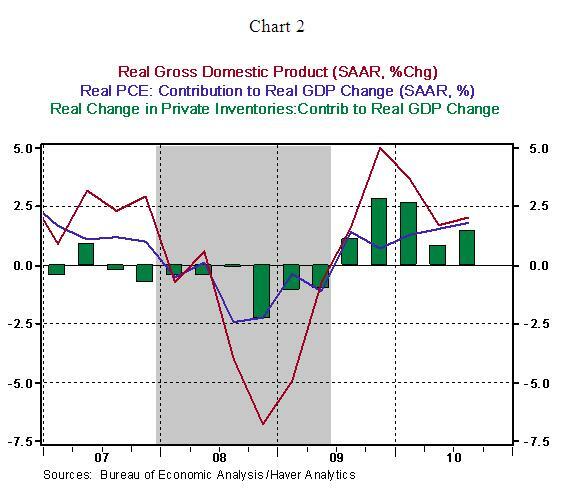 Inventory accumulation has played a large role in the growth of real GDP in the last five quarters (see chart 2). Contributions from consumer spending, equipment and software spending, and exports have also been noteworthy. Against the backdrop of a decelerating trend in final sales, the most recent inventory accumulation probably includes a significant involuntary component, which is less favorable than the inventory accumulation seen in the October 2009-March2010 period. 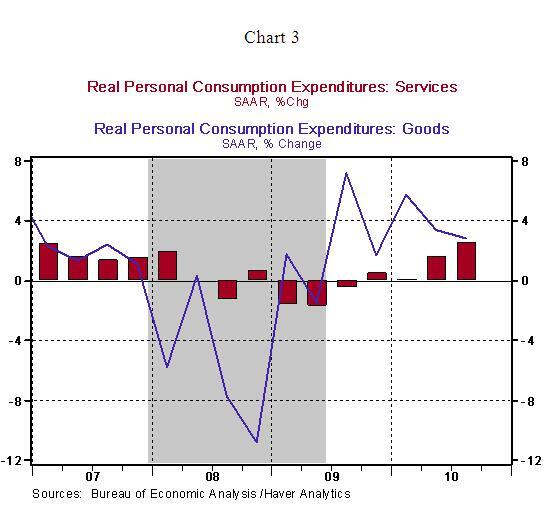 The 2.6% increase in consumer spending after a 2.2% gain in the second quarter is from stronger growth in services compared with outlays on goods (see chart 3). Among the components of business expenditures, the 3.8% increase in expenditures on structures reflects largely a gain in mining and exploration outlays and to a lesser extent the increase in power and communication related expenditures. Essentially, these numbers do not reflect an increase in other commercial construction such as hospitals, factories, and hotels. 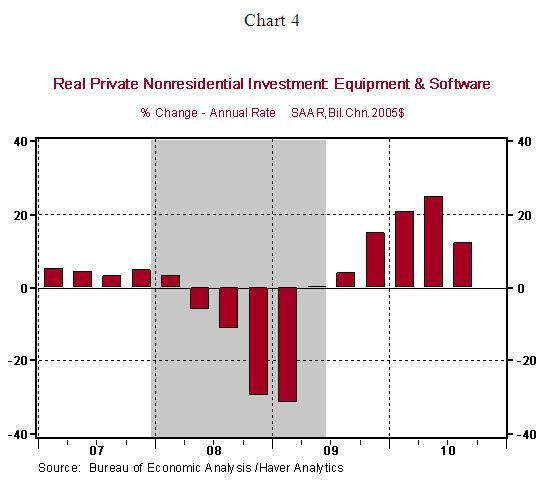 Equipment and software spending advanced 12.0% after a nearly 23% jump in the first-half of the year. The quarters ahead are likely to be marked with a decline in expenditures on structures and moderate growth in equipment and software spending. 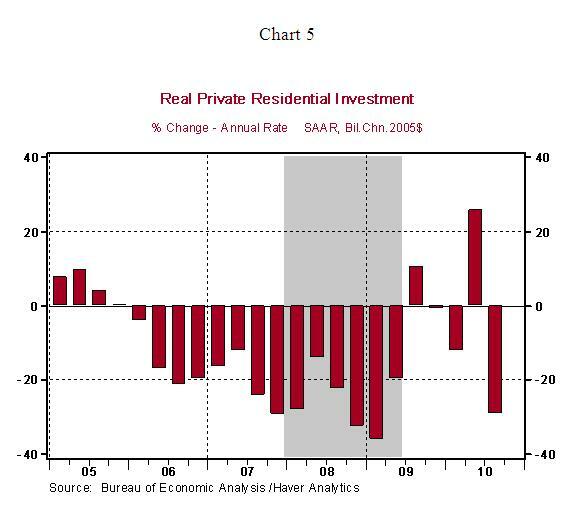 Residential investment expenditure fell 29.1% in the third quarter and erased most of the gains seen in the second quarter. The expiration of the first-time home buyer credit program is a large part of the reason for the wide swings in residential investment expenditures in the last two quarters (see chart 5). Going forward, residential investment expenditures are unlikely to make a positive contribution to real GDP given the sluggish hiring conditions despite the positive influences of low mortgage rates and favorable housing affordability conditions. 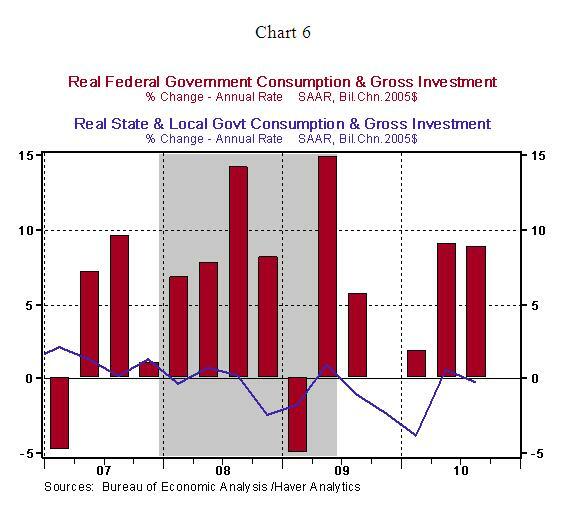 Federal government outlays moved up 8.8% in the third quarter, while state and local government outlays continued to show declines (see chart 6). As the stimulus package fades away in early-2011, federal government outlays will make a only small contribution to real GDP. 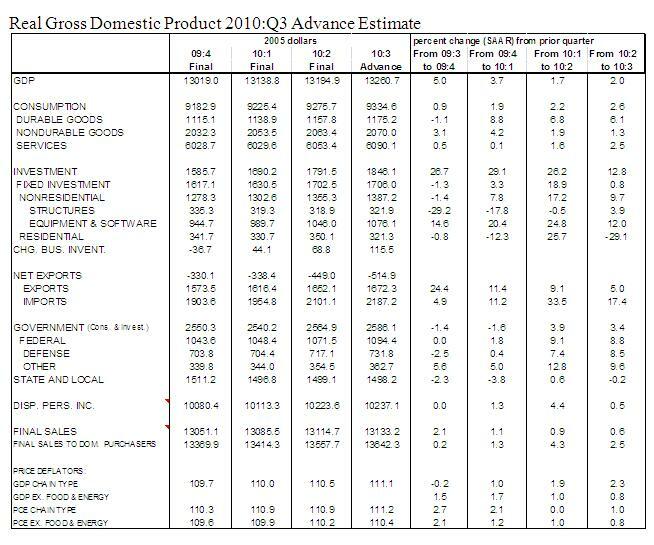 The fiscal pressures of state and local governments will continue to setback overall GDP growth in most of 2011. 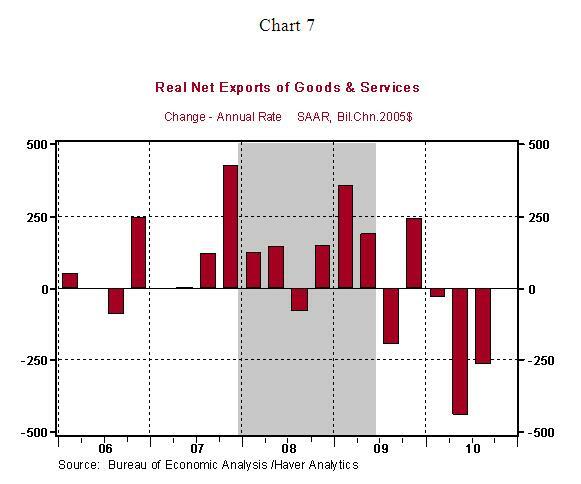 Exports of the U.S economy advanced in the third quarter but imports increased at a faster pace accounting for a significant widening of the trade gap in the second and third quarters of 2010 (see chart 7). The recent depreciation of the dollar should translate into a smaller trade gap in the final three months of 2010. The GDP price index rose 2.3% in the third quarter vs. 1.9% gain in the prior quarter. 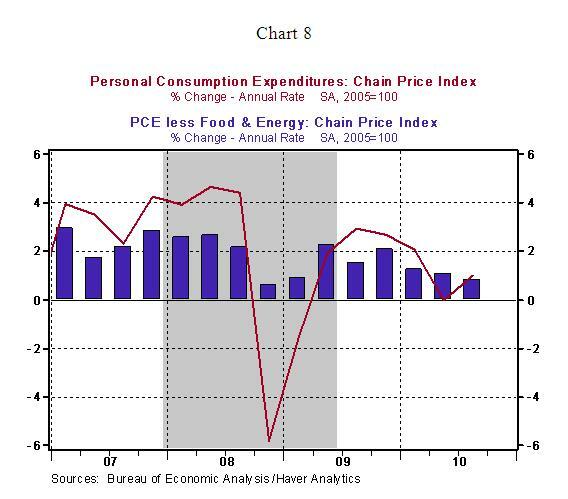 The personal consumption expenditure price index posted a 1.0% increase, while the core personal consumption expenditure price index, which excludes food and energy, rose only 0.8% in the third quarter. 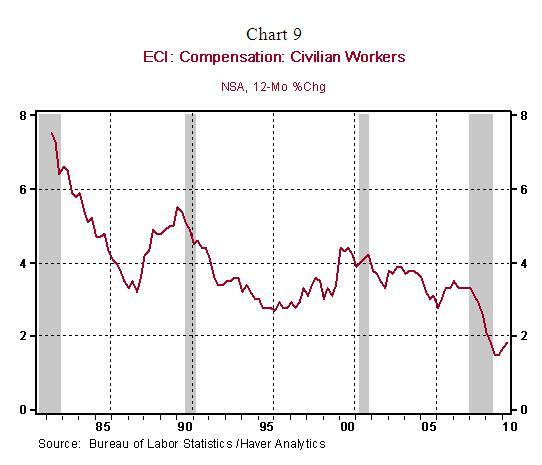 In other related news, the Employment Cost Index (ECI) increased a mere 0.4% in the third quarter. From a year ago, the ECI has advanced 1.9% vs. 1.8% in the second quarter (see chart 9), which significantly lower than gains in the neighborhood of 3.0% posted in the tail-end of the previous expansion. The overall declining trend of labor costs and inflation present a case of a tame inflationary environment. This favorable inflation picture gives the Fed latitude to focus on economic growth in the formulation of monetary policy. Speaking about policy, the November 2-3 FOMC meeting should end with the Fed announcing details of the second round of quantitative easing (QE). The main justification for QE2 is the subdued pace of economic growth which is inadequate to bring the unemployment rate, from the elevated level of 9.6%, in the near term.